IEEE VIS is the premier conference for Visualization and Visual Analytics research. 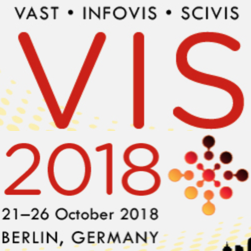 The 2018 IEEE VIS Conference will take place in Berlin, Germany in October, and VACLab research will be well represented. First, David Gotz is a co-author on a VAST paper titled “Visual Progression Analysis of Event Sequence Data” which describes the latest work to come from an ongoing collaboration with Nan Can at Tongji University and several other collaborators: Shunan Guo, Zhuochen Jin, Fan Du, and Hongyuan Zha. The paper will appear in IEEE TVCG journal paper and is available as an Early Access article via IEEE Xplore. A preprint of the article can also be found here. Second, Yufei Zhang (now a VACLab alum), David Borland, and David Gotz will present a poster describing their work on survey re-weighting. The 2 page article, titled “Increasing Understanding of Survey Re-Weighting with Visualization” is available here. The article introduce a web-based interactive tool to visualize the re-weighting process in surveys, with specific application to presidential election polls. A detailed description of the system’ s user interface and re-weighting algorithm are provided. In addition, the paper highlights results of a twenty-person user study evaluating the system’s ability to communicate the process and impact of survey re-weighting. Finally, David Borland and David Gotz co-authored a poster paper titled “Dual View: Multivariate Visualization Using Linked Layouts of Objects and Dimensions” which describes a new technique for multivariate data. The 2 page article is available here. The display of multivariate data is a common task in data visualization. However as dimensionality increases, it becomes increasingly difficult to visualize all dimensions using standard multivariate visualization techniques, such as parallel coordinates. Dimension reduction is often used to show relationships between data objects in a lower-dimensional representation, but the relationships between data objects and the original dimensions is typically lost. 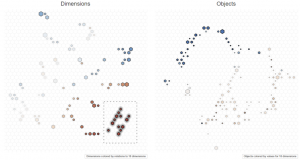 The article introduces Dual View, a visualization technique for high-dimensional datasets that directly represents both data objects and data dimensions in separate 2D layouts. Linked views, spatial aggregation, and iterative layout refinement enable the exploration of high-dimensional datasets. The article describes the underlying algorithms for layout and interaction, a prototype Dual View user interface, and some examples applying Dual View to multidimensional datasets. Note that both of the poster papers are based upon work supported by the National Science Foundation under Grant No. 1704018.